A man was charged with attempted murder following a stabbing at Leytonstone tube station on Saturday evening; other charges may follow. The video of the incident went viral, mostly, it seems, because of the statement made by an onlooker: "You ain't no Muslim, Bruv"
b. did not know the religiosity of the attacker prior to the incident. c. assumed the religion of the attacker from the attacker's demeanour and actions. 1: The onlooker jumped, fairly instantly, given the drama, to a conclusion akin to "if someone is attacking people in a terrorist fashion, it's likely to be a Muslim." So, a Muslim onlooker, identified a Muslim as a Muslim by his violence, then informed this violent Muslim, and everyone else, "You ain't no Muslim, Bruv", which one may only assume is short for "my brother in Islam". Is it just me or are there multiple layers of priceless but revealing irony in there? 2: I find it highly unlikely that any non-muslim onlooker would feel the need to deliver the defencive and deliberately distancing "He's not one of our gang!" meaning, which the phrase carries, however, if the onlooker had been non-Muslim, how many of that wider Muslim gang would have 'vocalised' outrage at the onlooker's clear assumption... "Goatee-chinned, non-white, knife-wielding attacker?? It must be a Muslim!"? Do you think there is any chance there would have been no cries of racism and islamaphobia from team Islam? The most recent reports claim the attacker has mental health issues but this would in no way mitigate the assumptions made by the onlooker about the actions likely to be carried out by those of his team. In the long history of struggle to keep civilisation civilised, can you think of a more intricately knotty problem for the governments and peoples of modern multicultural liberal democracies to untangle? How does one plan for the future of rational society, maintain and run a a civil civilisation when it's packed with people who think pretending is a rational course of action? Instead of pandering to the cravings of those raised to be dependent on religion, would it not be more rational and most likely a lot less bloody, to ask all those who are addicted to pretending, to just get clean? 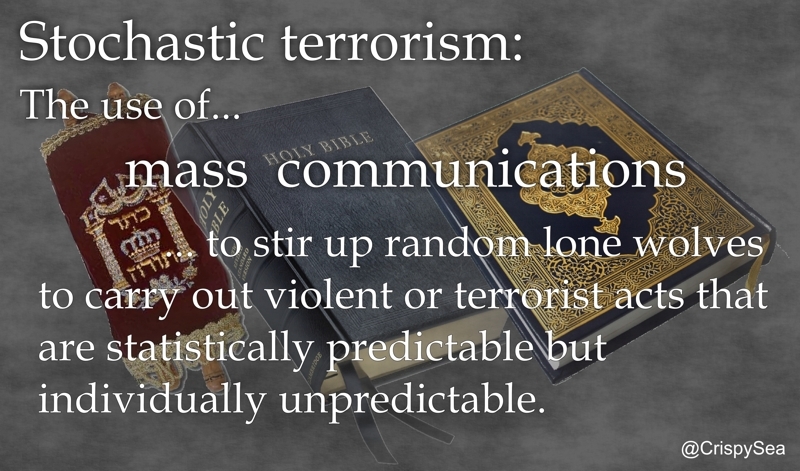 Whenever a religiously motivated terrorist commits an atrocity, have they acted alone? In a vacuum? No? Then what does the social landscape from which they emerged look like? All through their lives people around them have engaged in pretending God/Allah is important (As there's no proof of such, one may only pretend so.) and other equally ridiculous supernatural magical notions. Almost every person they ever met inculcated a praise of god's plan, a fear of hell, a wish for paradise and belief that this life is not all there is. Almost every person does this because of what they are taught by parent and tradition. Largely these pretences are born of the promises of a book of fables. With this in mind, below is list of points, written as if a believer is writing; the first two of which, I think, any good Christian, Muslim or other pretending type, would happily admit. 1. I am a happy, peaceful human. I live by the general principals - do unto others as you would have them do unto you / live and let live / do not judge before walking in their shoes. 2. I am religiously inclined - I believe in the immortality of person and the judgement of an eternal and perfect god. 3. I am fully versed in the text of the book and fully aware there are horrific commands to interfere with the rights of others, to the point of abuse or death, which are liberally strewn throughout. I choose to consider the text as peaceful and ignore the instructions I find abhorrent or outdated; justifying their apparent medieval immorality as "being written for a different time". 4. I consider myself an enlightened believer and would never choose to compromise my own personal morality by taking the commands to persecute too seriously. 5. I am fully aware that some people do not recognise the book for the "bit of harmless fun" it is, take it all too seriously and kill, persecute, shun, or show prejudice to, those whom the book deems sub-human for the fictional crimes of apostasy, blasphemy or other misdemeanour against its self-proclaimed supreme path. 6. I am fully aware I'm not qualified to judge which of those, to whom I reveal the book's message, will react like me, following merely the spirit of the book and ignoring its immoral commands, and which will take its extremist, fundamentalist, radical, violent commands as the direct instructions of how the god wants them to act. a. My child, relative, kin etc. b. Any fellow human I meet. ... and to hell with the consequences. 8. Some time later, one of those to whom I spread the "good" word, one formerly unaware of the book's message, (This would include any baptised offspring) shows up on the news, having slaughtered dozens of those the book deems sub-human. 9. I find the police at my door. If one is partly responsible for any charity work funded by one's tithe, zakat or other religious taxes, should one not also bear some responsibility for any atrocities also funded thereby? Given the trouble these fables engender within society, promotion of those notions as fact, simply so one can pretend paradise is a possible destination, is tantamount to "I'm just walking forward swinging my arms about; if someone gets hit it's not my fault!" and even if you are six that's unacceptably reckless behaviour, isn't it? Behaviour worthy of a scolding? Or maybe a lecture about intellectual integrity? And shouldn't such reckless pretending by adults be prosecuted? Ultimately though, does the responsibility not lie with the lies within the book(s)? 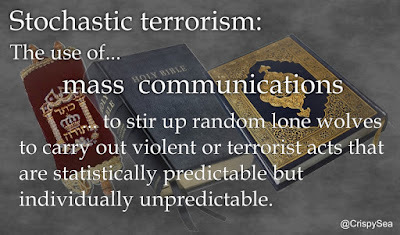 Should they not be classified as modes of communication for stochastic terrorism? You can probably guess where I stand. As even religious books do not themselves exist in a vacuum, are we ever going to accept that responsibility for the actions of an individual lies with every human who has interacted with them since birth or shaped the environment in which the individual grew? Reckless endangerment: A person commits the crime of reckless endangerment if the person recklessly engages in conduct which creates a substantial risk of serious physical injury to another person. “Reckless” conduct is conduct that exhibits a culpable disregard of foreseeable consequences to others from the act or omission involved. The accused need not intentionally cause a resulting harm. The ultimate question is whether, under all the circumstances, the accused’s conduct was of that heedless nature that made it actually or imminently dangerous to the rights or safety of others. Public endangerment is usually applied to crimes which place the public in some form of danger, although that danger can be more or less severe according to the crime.